A large compilation of documents relating to English law, this manuscript is only part of the original book, with others now kept by the Corporation of London and Oriel College, Oxford. 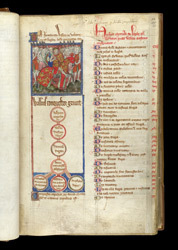 Compiled about 1321, it appears to have been connected with Andrew Horn, Bridge Street fishmonger and Chamberlain of the City of London who bequeathed the manuscript to the City upon his death in 1328. Written by several scribes, it was decorated by a team of artists, some of whom were working in a style seen in luxurious contemporary manuscripts from London, such as the 'Queen Mary Psalter' (now in the British Library). Its visual impressiveness and chronological ordering (not done since the 10th century) places its purpose beyond the utilitarian law book, perhaps as a history in times when the use and idea of law were changing. The 'Laws of Edward the Confessor' were written about 1140, about a century after he actually ruled. Nonetheless, the saintly king's image as lawgiver imbued these laws with almost magical power. Here the additional charisma of William the Conqueror (1066-1087) is called upon to enhance their force. The picture shows William on horseback with his army. He and his men are inaccurately shown in later medieval dress and armour, but accuracy probably was not the point. The king would be recognised as an English one, backed up by the genealogy which descends from the picture.